All right, so I’ve dealt with the remastered editions of some VERY big heavy hitting talent in recent days, first David Bowie with his Loving The Alien boxed set, which includes a pretty good re-do of what many consider his career worst album, Never Let Me Down, and more recently the beautifully remastered The Beatles, aka The White Album. You can read about the Bowie remaster here and The Beatles here. Remastering albums is certainly not a new thing, and at times it has been met with anger. In recent years, however, it seems like newer remasters have been better. Certainly in the case of the Bowie and The Beatles albums, it was for the best. Megadeth, one of the pioneer thrash/heavy metal groups fronted by one-time Metallica member Dave Mustaine, released their first album in 1985. Titled Killing Is My Business… And Business Is Good, it was a more than decent first effort with some really fun songs (I loved the very profane remake of These Boots). The sound, however, was quite muddled and, when I heard Mr. Mustaine was remixing the album back in 2004, I was hopeful that the muddled sounds would be alleviated. Alas, the end result was not very good. Worse, the original authors of These Boots were apparently quite offended with Mr. Mustaine’s… uh… reinterpretation and new lyrics of the song and would not allow it to be re-released as it was. So, in a very silly move, the remixed version of 2004 featured the song with “bleeps” to negate the offending lyrics. Fast forward to (and unknown to me until yesterday) June of this year and a new re-mix of Killing Is My Business was released. 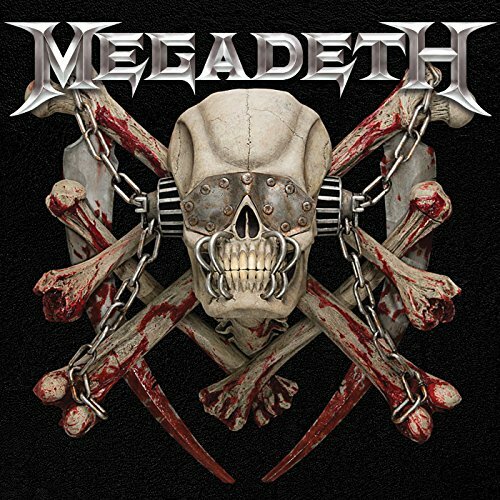 I have to say, Killing Is My Business is a terrific improvement over the original 1985 release and most certainly much better than Mustaine’s 2004 remix. If you like that album, getting this remaster is a no-brainer. As for These Boots… it appears we’ll never again see the release of the original Megadeth version of the song. However, this time around they wisely nixed the whole “bleeped” version of the song and, instead, remastered the music and had Dave Mustaine simply sing the song with its original lyrics. Yeah, it isn’t quite as darkly funny as the original version and, yeah, Dave Mustaine’s voice is clearly more worn down than it was on the original album (decades of concerts and singing will certainly do that to you… check out Bruce Springsteen’s voice in some of his earliest albums versus while currently on tour). So, if you’re into 1980’s era speed/thrash metal, checking out the most recent remix of Killing Is My Business is a no-brainer. Yep, its the entire run of the Corrosive Knights series (my own copies) laid out on the floor just so I could admire ’em. Note the many little stickers I’ve put into various books. This was done to keep track of certain characters/scenes. Also note the covers to Books #2 (The Last Flight of the Argus) through #6 (Foundry of the Gods) have the “old” covers. 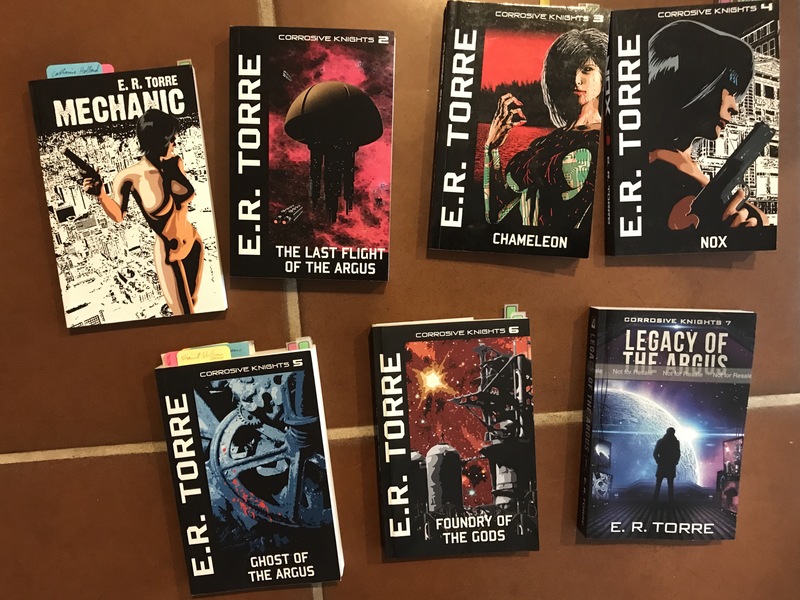 For now, if you order the books through Amazon (you can check ’em out here), you will get them with these original covers and as shown in the photograph. 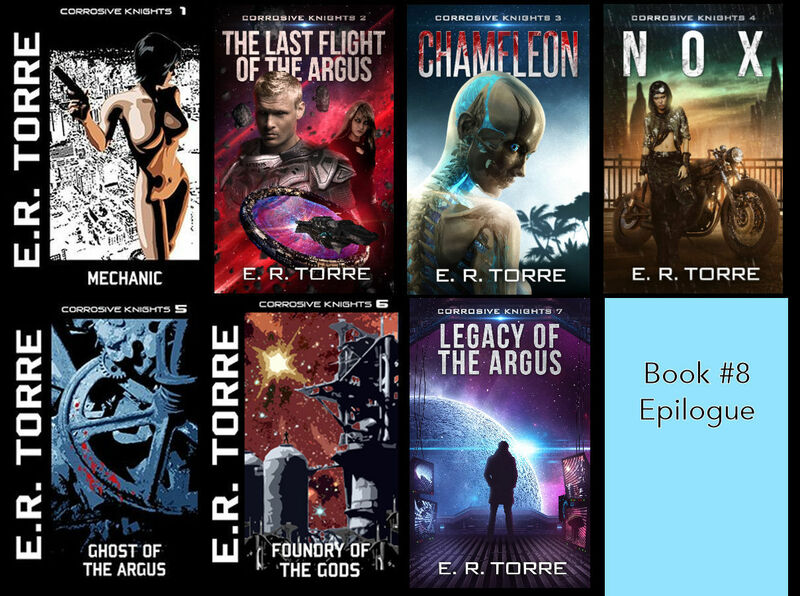 Very soon, though, these books will be upgraded to the new covers I’ve shown off before (just scroll down a few posts… you can’t miss ’em!). If you look closely at the cover to Legacy of the Argus (the last book in the series, #7), you’ll see a gray band on the upper half of the book and over “The Argus” on the title. It is a “Not for Resale” statement. The copy I have of the book was a “preview” copy I ordered so I could see how the novel looks and then determine if it can be formally made available via Amazon. I have made it available although, for now, Amazon hasn’t linked the Kindle (digital) copy with the Paperback. I assume that will happen soon enough. UPDATE: It’s happened. 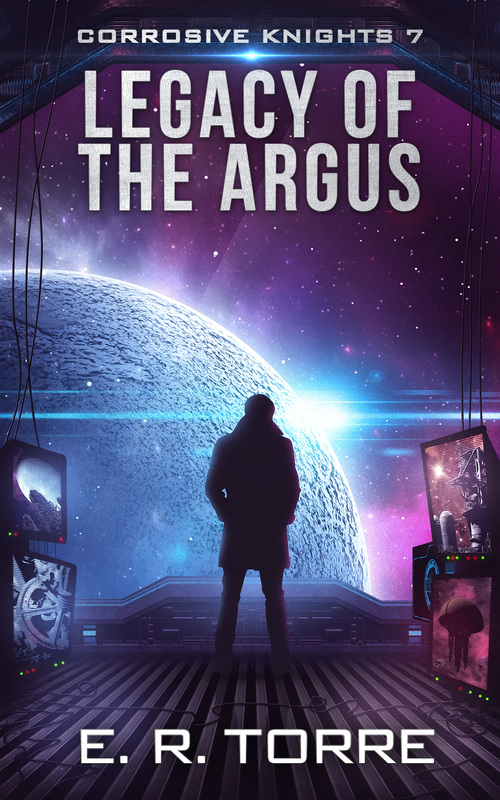 When you click on The Legacy of the Argus via Amazon, you’ll have the option of getting the Kindle/Digital copy or the paperback. On November 22, 1968 The Beatles released an untitled double album which, over time, came to be known as “The White Album”. The album, IMHO, is incredible and, in retrospect, one can view it as something of a line in the sand. There’s the stuff that came before and, sadly, this album was pointing toward what was to come, ie The Beatles’ eventual breakup. The album features a mind-bogglingly number of great songs in so many different genres that one can’t help but admire the group’s ability to stretch their boundaries. There are rock songs, there are ditties. There are songs that seem to fall into country, there are songs that fall squarely into a avant guard. There are fragments of songs, there are songs that seem almost like children’s compositions. There are hard rockers and even what can be called a proto-metal composition. There’s an incredible amount of music of all different types and what’s the most amazing thing is that when one listens to the album, it feels like there’s a flow to the compositions, a logic that only a band with as much talent as The Beatles could dare to try… and, incredibly and perhaps improbably, succeed. For the most part, anyway. There are those who feel there’s a superb single album buried in this double album, and even I have some songs I don’t care that much for. Still, how can you knock something that ambitious and successful? When I heard Giles Martin, son of the late George Martin who was the original producer of almost all of The Beatles’ albums, was doing to The White Album what he did to Sgt. Pepper’s Lonely Heart’s Club Band, i.e. doing an intricate remastering, I was so there. What Mr. Martin did with Sgt. Pepper’s was revelatory. He made an already superb (IMHO!) album sound even better, and managed to make two songs in particular I didn’t care as much for on the album shine like they never did before. This past weekend I finally got my hands on the “Super Deluxe” edition of The White Album’s re-release. Starting with the original album itself, I have to once again give Mr. Martin an incredible amount of credit. The songs sound extraordinary, and he’s managed to make some compositions I didn’t care all that much for suddenly light up. He’s brought the instruments out and made the voices clearer and… jeeze, its like you’re there in the studio, listening to the lads as they play the material for you. There is an intimacy and clarity you didn’t realize the album needed to make it even better than it already was (and, if I haven’t made it clear already, I felt the album as it was was pretty damn great to begin with). And the bonuses… oh my. First up are the so-called Esher Demos. After finishing their trip to India, The Beatles got together at George Harrison’s house and essentially created rough demos of the majority of the songs that eventually made their way to The White Album. Here then you have those demos and they’re wonderful to hear in their embryonic, and sometimes quite close to finalized, form. You also have some songs that didn’t make the cut -at least not at that point- which are fascinating to hear as well for a total of 27 songs. Following that you have another FIFTY alternate/early takes of the various songs which eventually made it to The White Album along with a few that did not, including early versions of Hey Jude, Across The Universe, and Let It Be! Incredibly fun stuff to hear and it again makes you realize that this band, when it came to music, was on a whole ‘nother level when it came to releasing original compositions. The price for the Super Deluxe edition of The White Album ain’t cheap. The CD release will set you back about $140 and I can’t even begin to guess how much the vinyl version is. There is a cheaper CD version (I saw it at Target on sale for around $25) which includes the full album plus the Esher Demos. It does not include the other bonus material, including all the other takes of the songs plus those I mentioned above. So if you’re anything at all like me, you either get the whole thing or nothing at all. If you don’t feel you need the wealth of other demos/alternate takes, then you may be fine getting the smaller package. Either way, this is a hell of a gift to music lovers and The Beatles lovers in particular. A very, VERY easy recommendation. I find such lists fascinating, and I do have to offer my 0.02 cents. Worst song on the album? It may be Wild Honey Pie for me. Or perhaps Revolution #9, John Lennon’s trip into the avant guard. However, listening to these songs now, in this freshly remastered version, has quite literally opened my ears and even these works feel fresh and interesting to me. George Harrison’s While My Guitar Gently Weeps is terrific, as are Lennon compositions like Dear Prudence and Julia. Much as I like the single version of Revolution, the slower, bluesier Revolution #1 is quite terrific as well. Paul McCartney was also on a roll, bringing some great rockers like Birthday, Back in the U.S.S.R. (a hilarious parody of Beach Boys-type “Americana” music), and, especially, Helter Skelter, easily the “hardest” music The Beatles ever made and arguably one of the earliest “heavy metal” tunes. All of it is damn good stuff! Corrosive Knights, a 11/21/18 update – Foundry of the Gods! Next up is a remake of the cover to Book #5, Ghost of the Argus. After that, I’m done. 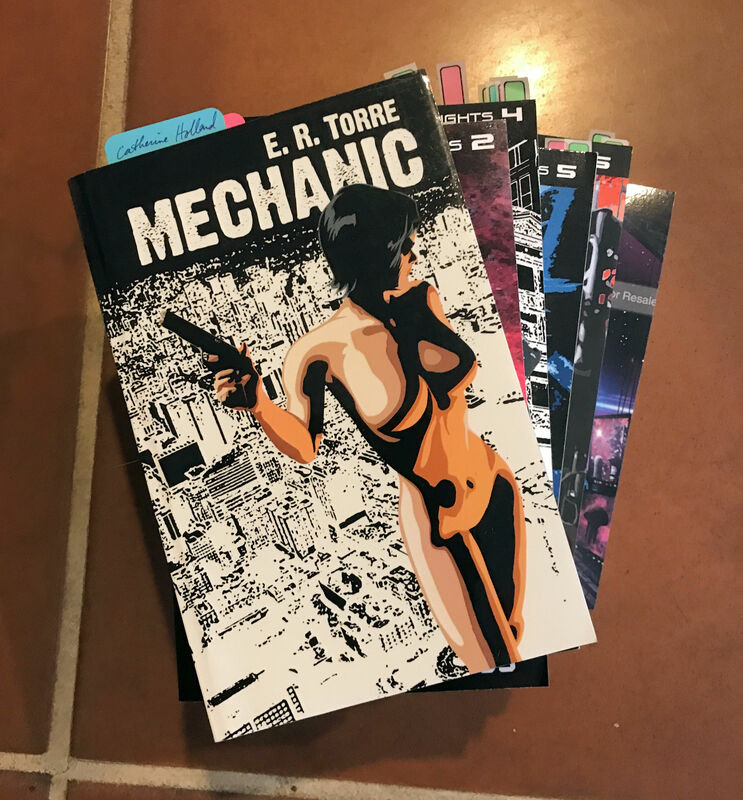 I like the cover to Mechanic (Book #1) and will likely keep it as is. I may, in some future date, change my mind, but for now I’m happy with it! 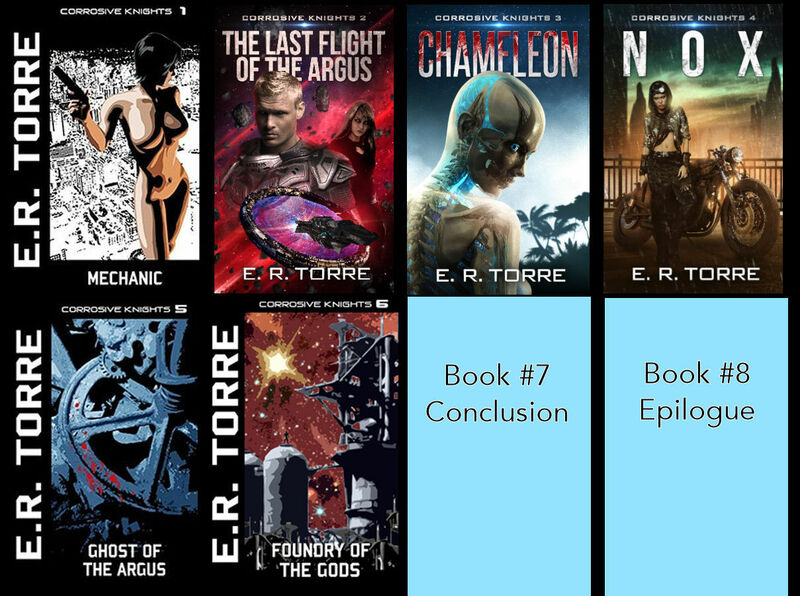 Soon enough, all these covers will be available in the paperback editions! Corrosive Knights, a 11/15/18 update… Legacy of the Argus! 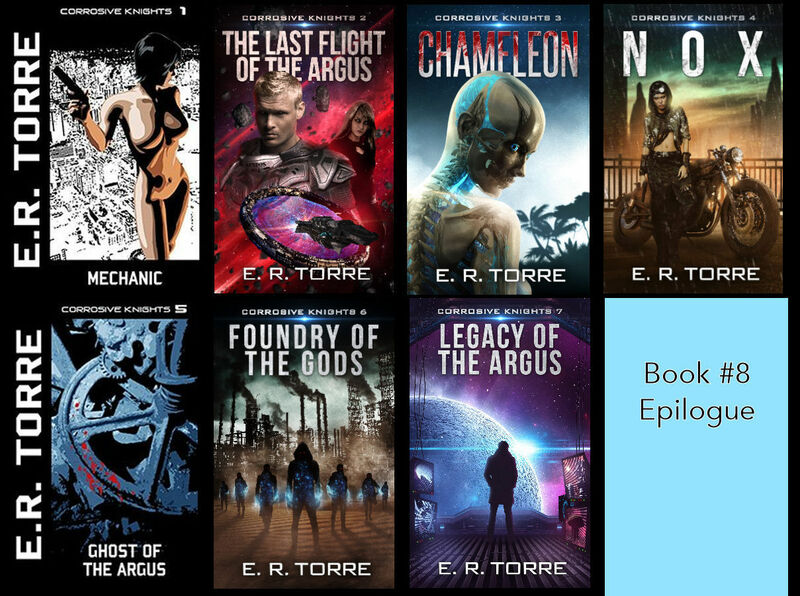 Legacy of the Argus, the concluding chapter to the Corrosive Knights series, was made available, via Amazon Kindle, yesterday, November the 14th. The paperback will be made available as soon as possible, perhaps by next week. I’m incredibly proud of the book and the series and hope those who have enjoyed previous books give it a try. Legacy of the Argus ties up all the various strands in the Corrosive Knights series and answers any lingering questions. 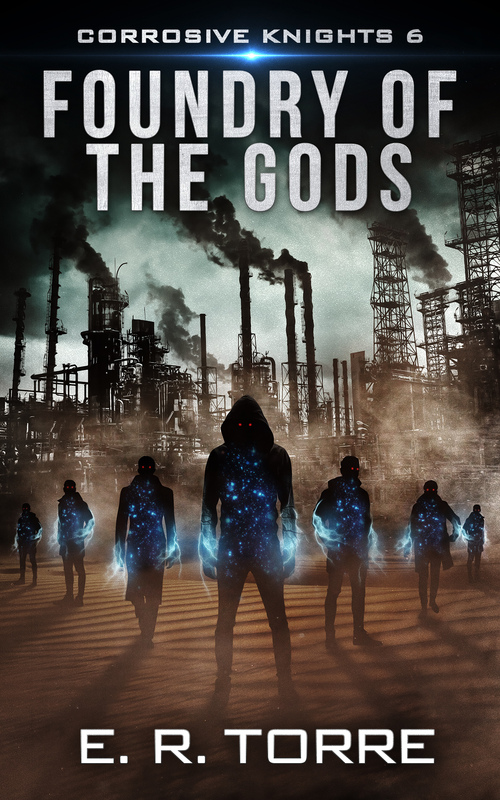 As for Book #8, I’ll be getting to it as soon as I finish up all the remaining work that needs to be done with Legacy of the Argus, ie getting the listings correct and getting the paperback ready for sale. Sad word reached the news today of the passing of Stan Lee at the age of 95. Mr. Lee is, of course, known as the guiding force behind Marvel Comics and was listed as the co-creator of many of the biggest, best known heroes published through the company, including the likes of The Fantastic Four, Spider-Man, The Hulk, etc. etc. Apart from being involved in some truly wonderful comics released from the early 1960’s, what made Mr. Lee so unique was that he became a full throated cheerleader and face of the company, something which didn’t really exist in comics before that time. He created a sense of down to earth friendship between reader and creators and seemed to “talk” to readers and wink at them while barking/hyping the latest works. This served him very well as Marvel Comics went from another so-so company to the biggest selling comic book company under his stewardship. When the Marvel movies started to take off, he continued to be the face of the company by making amusing cameos in the many Marvel based films, often providing jokey lines and humorous bits. His career, however, was not without some controversy. As amiable as Mr. Lee appeared in public, the fact of the matter is that two of his principle cohorts, Jack Kirby (who co-created most of Marvel’s characters, including The Fantastic Four) and Steve Ditko (co-creator of Spider-Man and Dr. 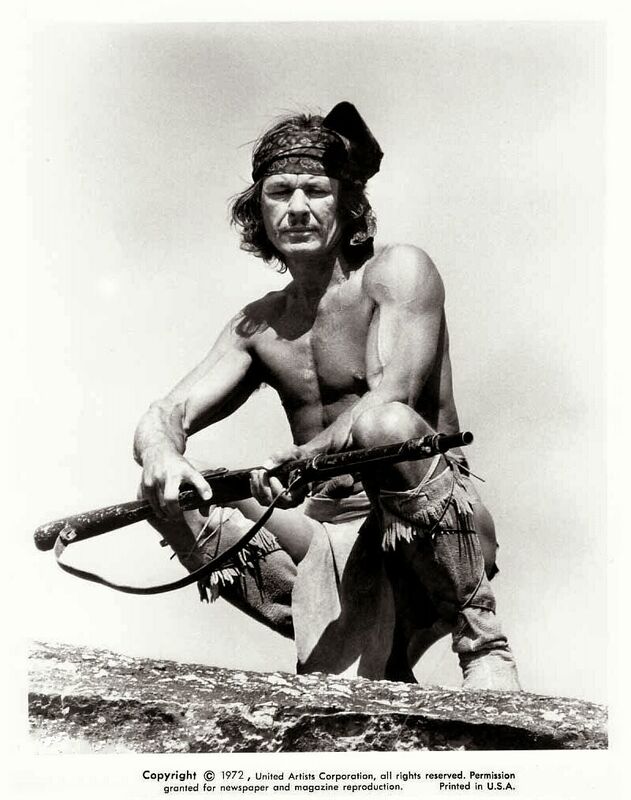 Strange, among others) both had a falling out with Mr. Lee in the later half of the 1960’s and left the company. It was reported they were both unhappy with not only the rates they were getting for their artwork but also with the credit Mr. Lee gave himself for the books they worked on with him. I know this might be very “inside baseball”, but Mr. Lee developed a method of “writing” comic books where he would get together with the artist and provide a light sketch of a comic’s plot. The artist would then essentially create the entire book and Mr. Lee (or whomever was listed as the writer of the book) would come in afterwards and provide dialogue. Amusingly, there were times when the dialogue didn’t fit what you were seeing on the page, though this didn’t happen all that often. But the point is this: Jack Kirby and Steve Ditko felt they were doing more than “just” drawing their respective books; that they were writing AND drawing them only to have Mr. Lee come in afterwards and dialogue them and then take the sole credit for being the book’s “writer”. To be fair, Marvel eventually offered more credit to books made by both Kirby and Ditko, but by that point the bad feelings were obviously overwhelming and the two left the company they helped make so very successful. Still, Marvel succeeded and without Stan Lee would likely not have become the juggernaut it became. Whether he came up with more or less of the stories than were attributed to him, his dialogue and descriptions presented on many a page were both playful and exciting and, in the editorial/mail pages, he could sell a book like no other. Truly there hasn’t been anyone in this industry remotely like him. One can’t help but admire the length and breath of influence Sir Conan Arthur Doyle’s most famous creation, Sherlock Holmes, has had over the years. There are so may works featuring oddball/quirky detectives solving bizarre crimes while accompanied by their more “normal” sidekicks/partners and almost every one of them owes gratitude to Mr. Doyle’s Holmes. So too it is with the late Stieg Larsson’s original Milennium Trilogy of novels, the most famous of which was the first titled The Girl With the Dragon Tattoo and which has already been filmed twice featuring both Noomi Rapace and Rooney Mara in what is the most provocative role of the books, that of punk hacker -and oddball- extraordinaire Lisbeth Salander. Salander’s Watson is journalist Mikael Blomkvist and their setting is the cold environs of Sweden. The Girl in the Spider Web, based on a “new” Dragon Tattoo novel by David Lagercrantz, features Claire Foy as Salander and Sverrir Gudnasson as Blomkvist. The movie takes place a few years after the original trilogy of stories and we find Salander hired by a skittish American techno genius who created a program capable of linking up and taking over every nuclear missile in the world. He fears he made a very big mistake in both creating and giving the program to the U.S. government and wants it back so he can get rid of it. He asks Salander to get the one and only copy of it from a Pentagon computer and she agrees (plot hole #1: Do you really think such a powerful program would somehow be limited to one copy only?). Anyway, what Salander doesn’t realize is that there are already eyes on her employer and, after she manages to get the program, the evil schenannigans start and, soon enough, Salander is on the run for her life. After her apartment is torched with her in it (plot hole #2: Do the villains want to kill Salander or frame her? Truly this is the most irritating bit in the film and reminds me of the same problem with the last James Bond film Spectre. The villain seems to want the protagonist to live so that they can personally take them out, yet their henchmen sure do seem intent on killing the protagonist anyway! ), Salander enlists the aid of journalist Mikael Blumpkist and the game of cat and mouse formally begins. Despite those two very irritating plot points that I mentioned above, The Girl in the Spider’s Web is a decent enough film which, sadly, winds up being its main problem. Apart from those two irritations, there is nothing in the film that will make you howl or shake your head or scream at the screen. Alas, neither is there anything in this film that will blow your proverbial socks off. You’ve seen most of this stuff before, and at times far better, in other works. 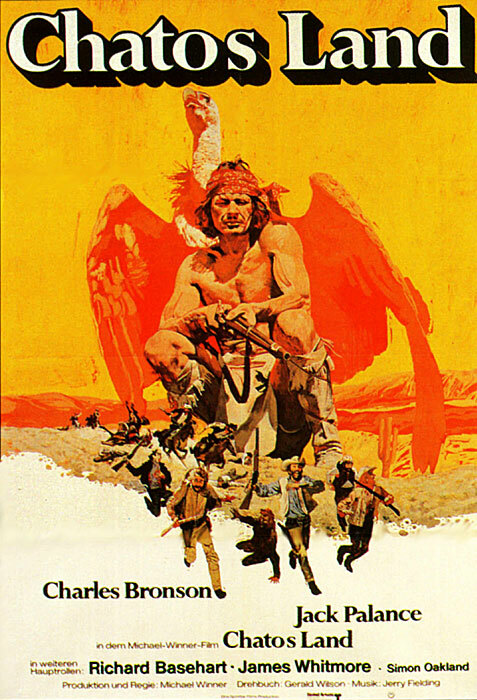 While the film is handsomely constructed, well directed, well acted, and the scenery is pretty, the plot and story provide little punch and, ultimately, are rather weak tea. I suspect over time this is one of those films that will drift out of my mind and soon be forgotten. Neither terribly good nor genuinely bad, The Girl in the Spider’s Web just is. A few days back I stated I might be at the Miami Gamer Comic Expo which starts today and goes on through November 12. Sadly, things didn’t quite work out so I won’t be there. I took a few days to clear my head from the book and yesterday slowly began the process of re-reading and doing pen/ink revisions on Draft #12 -what I’m quite confident will be the last draft- of Book #7. So far, the revisions are incredibly minor. which further enforces the notion that this will indeed be the final draft of the book before I release it. The cover is almost complete, I expect it will be done either later today or at most tomorrow. So all that’s left for me to do is read the damn thing, write those pen/ink revisions, then transfer them to the computer. Once that’s done, I format the book properly and then, it WILL be released. Perhaps even later next week. 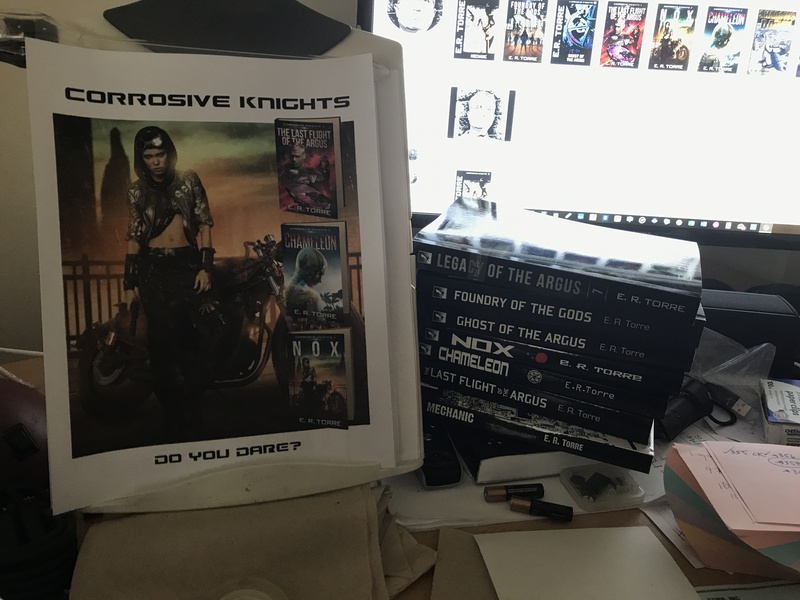 Interestingly enough, I was looking at my old novel files and Foundry of the Gods, book #6 in the Corrosive Knights series, was completed on, believe it or not, 11/6/16 and just shy of 7 P.M. This was the last time I saved the file before it was sent off to be published through Amazon! So today we are exactly two years and one day from that date and I can’t help but be amazed at how consistent, time-wise, I am with the release of each new novel. Yeah, in this case it looks like it’ll take me two years and perhaps a week to complete Book #7, but isn’t it amazing that the final draft is completed so damn close to the very date I completed the final draft of the previous novel?